We are nearing the end of another exciting and busy high season and already preparing for 2019/2020. We are thrilled to announce that Royal Caribbean’s Freedom of the Seas will be visiting Bonaire every two weeks this summer. In addition, Pullmantur’s Monarch will be returning once a week as well. For those of you staying on the island we’d love to see you at the Market this summer! Our weekly schedule can always be found on our Facebook page. Please like and follow us to keep up with all that’s happening here at the Arts and Crafts Market. See you soon!! Bigger and better than ever in 2019! 2019 is here and our Market is bigger and better than ever! We are halfway through our high season and again it has been one of the biggest to date. We have added talented new artists and products this year - they can be found along with all our regulars whose work is some of the best you will find anywhere. We will continue to update our News periodically. But, for all of the latest happenings and schedule changes please ‘Like' and follow our Facebook Page. We can’t wait to welcome you to our beautiful island 😉. We are thrilled to announce that we have received the 2018 Certificate of Excellence Award from TripAdvisor. Thank you to everyone who visited and reviewed us this year. We're looking forward to our biggest cruise season yet in 2018/2019. Continue to check our Facebook page for the most recent news and goings on at our Arts and Crafts Cruise Market - along with periodical updates here on our site 😉. Our High Season is over and preparations have already begun for next season - including restoration and repair of all 3 piers. As a result, Pullmantur will be the only cruise line visiting us this summer and docking at the North Pier until work is finished on the South. According to the government the construction is on schedule and we will be ready for everyone in the Fall. In the meantime, we will be in Wilhelmina Plaza every Tuesday from 7am - 5:30pm to welcome the Monarch to our beautiful island. THANK YOU to everyone who visited us in 2018!! Our 2017/2018 Cruise Season is winding down. We have a little over a month left until low season begins and we start preparing for next year. Please continue to check our Facebook page for the latest on the market as well as weekly updates to our schedule. We want to thank everyone who visited us this year - we truly appreciate the time you spent at the market and we hope to see you again soon! 2018 is here and it is very busy. This high season Bonaire is welcoming more cruise ships than ever before. We are thrilled by all the new people visiting our beautiful island - many for the first time. We are looking forward to seeing you at the Arts and Crafts Cruise Market. If you are seeking weekly updates to our schedule or for more information about all the wonderful artists you will find here, please visit our Facebook page by clicking the square 'F' at the bottom of this page. We'll see you very soon!! We'll see you at the Market in 2017/2018!! We are thrilled to announce that our 2017/2018 Season at the Bonaire Arts and Crafts Cruise Market will be the busiest in our twenty year history. You can always find the most updated market schedule here on our website. For more information on all of our artists and their work please visit our Facebook page - which is constantly being updated with the market's most recent art and craft items along with the various food, drink, and music options, as well. We are looking forward to your visit to Bonaire and as always, please don't hesitate to get in touch with questions. We are happy to announce our upcoming cruise schedule through December 31, 2017. It is going to be the busiest and most exciting high-season to date in Bonaire. We are looking forward to your visit to our beautiful island. 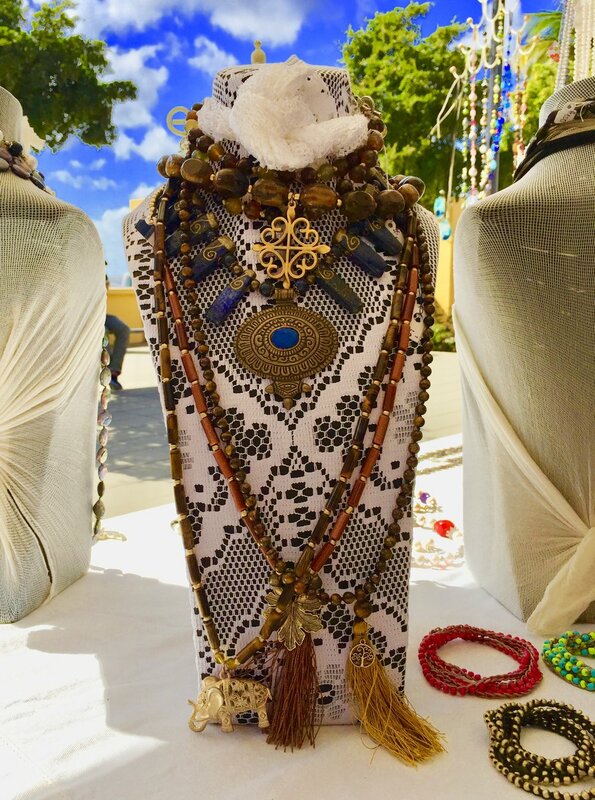 Be sure not to miss one of the most unique and eclectic arts and crafts markets in the world! When it’s fall in Bonaire and the summer-peak travelers are long gone, visitors can take advantage of countless savings and value added perks that only this season brings. Whether you’re a first time visitor, or a Bonaire Ambassador, this is the time of year when the island can become your own. From mid-August through early November, the Bonaire Fall Festival has a lineup of accommodation packages, unique excursions, underwater and topside adventures and culinary specials that make Bonaire the top spot to DIVE – DINE - DISCOVER this fall. The travel window for the fall program is August 19 – November 4, 2017. Follow #BonaireFallFestival to stay current on the latest activities! We have reached the end the busiest high season yet at the market. This year we have had the MOST visitors ever to Bonaire via cruise ships. Please check our Cruise Schedule to see what days we'll be in Wilhelmina Plaza in the low season -- it's listed on our website and Facebook page, as well. We have also added a TripAdvisor tab on our Facebook page to make it easier for you to review us. Just click on the button below to post your review - we really appreciate your support.